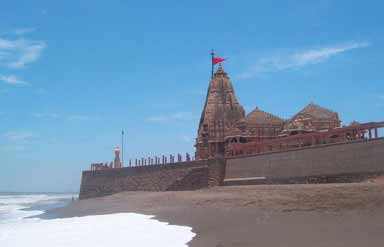 On the coast of Arabian Sea, Somnath is a historic temple and a living testimonial of rich cultural heritage of India which stood the harsh test of time. It is located about 5 km from Veraval a municipality in Junagadh district in the Indian state of Gujarat. Based on the mythology, it is believed that the Somnath temple was originally built by Somraj, the Moon God himself out of gold then rebuilt by Ravana in silver, then by Krishna in Wood and by Bhimdev in stone. 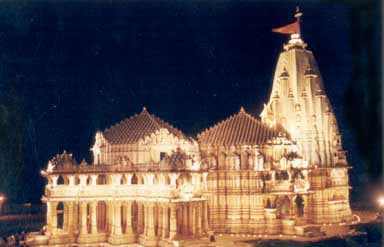 Somnath Temple stands as a symbol of rich cultural heritage of India. This is one of the 12 Jyotirlingas or religious Shiva shrines of India which is mentioned in several scriptures especially in Rig Veda. It is also known by several other names like Deo Pattan, Prabhas Pattan or Pattan Somnath. Based on the writing of Arab traveler Al Biruni, this temple was known for fabulous treasures and richness. He quoted that the temple had 300 musicians, 500 dancing girls and 300 barbers to shave the heads of visiting pilgrims. He also wrote that people from the remotest parts of the country came to worship at the shrine. Revenues collected from ten thousand villages were spent on the maintenance of the temple. Two thousand Brahmins (priests) served the idol and a golden chain attached to a huge bell plate announced the commencement of prayers. The magnificent glory and tremendous wealth of this temple attracted several invaders who came and plundered its architectural beauty and looted its fabulous wealth. Mahmud of Ghazini was first among them who ransacked and destroyed the temple in 1025 CE. It was immediately rebuilt by King Bhima of Gujarat and King Bhoja of Malwa. This temple was destroyed again by Alaf Khan, the general of Allauddin Khilji in the year 1300 CE. It was rebuilt by King Mahipala of the Chudasama dynasty. This shrine was destroyed again in 1390, 1490, 1530 and finally in 1701 by Aurangazeb. It was rebuilt with perseverance each time after it was destroyed. 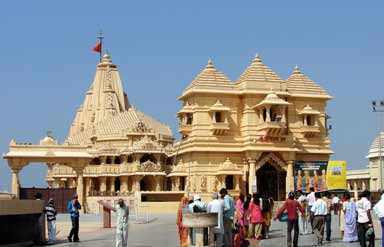 The temple is situated at such a place that there is no land in straight-line between Somnath seashore till Antarctica. This inscription in Sanskrit is found on the Arrow-Pillar called Baan-Stambh erected on the sea-protection wall at the Somnath Temple. The inscription on Baan-Stambh mentions that it stands at a point on the Indian landmass which is the first point on land in the north to the south-pole on that particular longitude. This is the most important temple and main highlight of Somnath known round the world for its magnificent architectural beauty. Among all the attractions of this temple the most fascinating one is a 50-meter high tower renowned for its intricate carvings and adorned with number of holy idols and images. The marvelous sculptured beauty of this tower showcases varied facets of Hindu religion. The blended beauty of carving and color combinations enthrall tourists during their visit to this place. The museum of this temple is famous for its rich collections of artifacts and historical objects which throw light on the golden ages of this temple. There are also several excavated items inside the museum which showcase the rich historical and cultural legacy of this temple. Pilgrims can avail the guest house facilities of Shree Somnath Trust. Trust maintains a VIP Guesthouse, eighteen other guest houses and an economical dormitory. The total number of rooms in the trust guest houses is two hundred. The temple remains opened from 6.00 am to 9.00 pm. 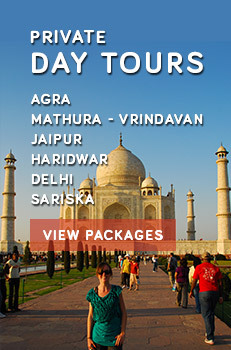 Devotees can also enjoy Aarti which is held three times a day at 7.00 am, 12.00 pm and 7.00 pm. Do not miss the Sound and Light Show during Somanth Temple Visit. The timing of this light show is 8.00 pm to 9.00 pm.